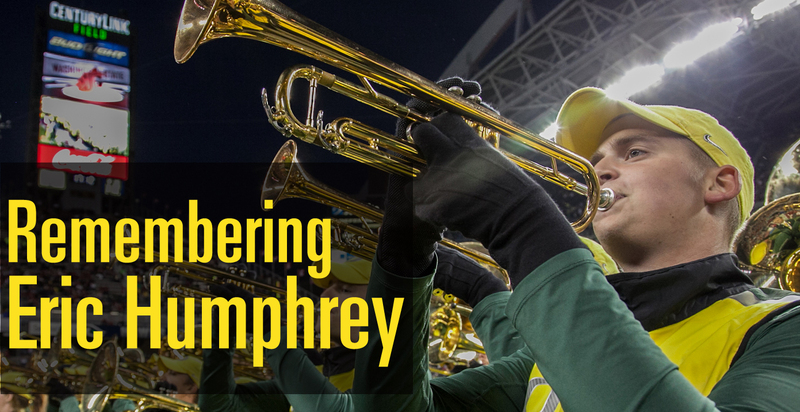 There are a multitude of ways to “rise to fame” in a group so large, diverse, and high profile as the Oregon Marching Band. Some members make an early mark by distinguishing themselves as an elite musician. Several climb the ladder by seeking out and obtaining various student leadership positions. Others find their way by volunteering for anything and everything, serving the group behind the scenes.In all honesty, any of these paths above could be used to describe Eric Humphrey. 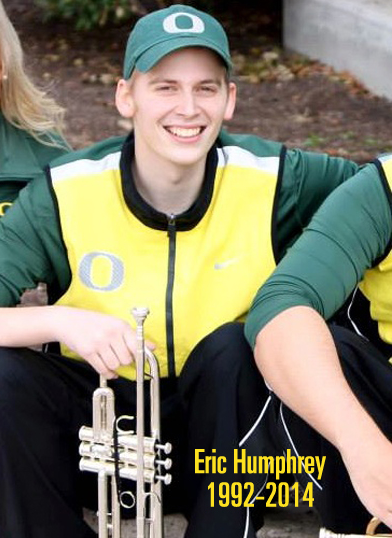 However, Eric didn’t make a place for himself with his trumpet, leadership skills, volunteerism, or popularity. 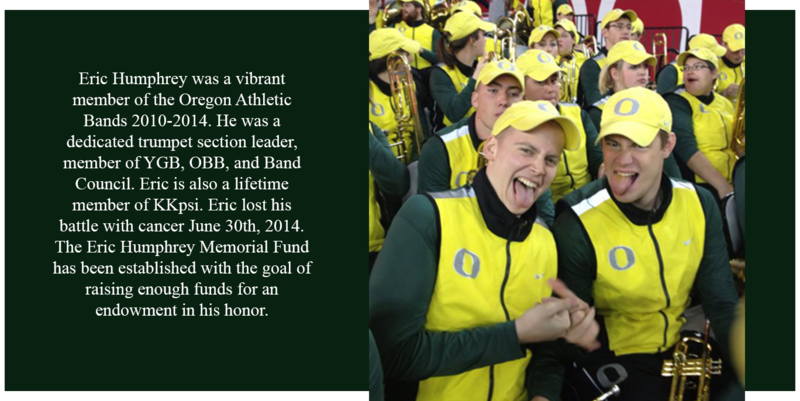 Eric forged his legacy through his spirit, his heart, and his kindness. 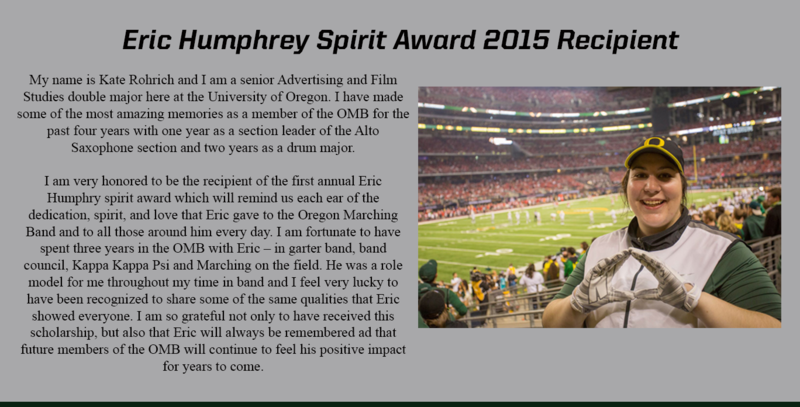 When Eric joined the OMB as a freshman, people instantly gravitated towards his personality. He had a way of making everyone around him feel immediately at ease and welcome, even though it was he who was the new member. His friendships crossed throughout the entire band, regardless of age, instrument (code: cliques), or social status. It takes a truly special person to create a unique bond and genuinely care about each new person they meet. When Eric was diagnosed with cancer, the band took action. T-shirts were made, blogs were written, heads were shaved, support was aired. If you ever want something done right, mobilize a marching band. Through all the spectacle, one constant remained: Eric cared for others. When members went to offer their support to Eric, hoping to give him a recharge, it was they who left rejuvenated. While we were the ones thought we were encouraging Eric, it was he who was inspiring us. For the remaining years following Eric’s diagnosis, he became the soul of the band. When Eric was on the field, the band worked a little harder. When Eric was in pain, the band was resilient. When Eric was healthy, the band flourished. Now that Eric has passed, the band and its members have developed the emotional fortitude needed to move through any numberof difficult life circumstances. Most importantly, Eric taught us life’s most significant lesson: care. Care for anyone. Care for everyone. Show you care. Say you care. Make yourself available to a new friend or experience and the rewards will be plentiful. Eugene, OR 97403-1950 An overwhelming amount of support has come in over the last couple of years that has met and exceeded our goal. Thank you for your help in establishing an endowment that will allow us to honor Eric every year.